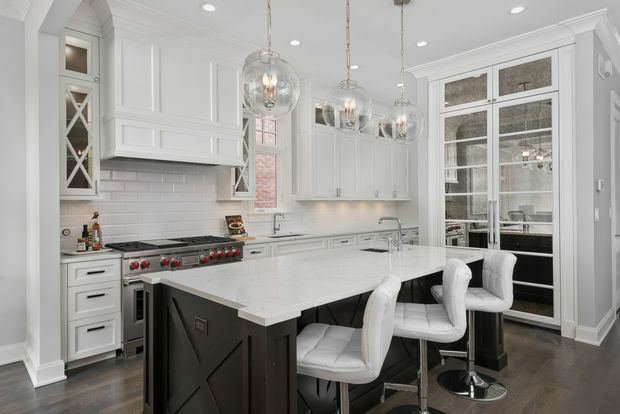 LAKEVIEW — A new six-bedroom home at 1437 W. Melrose St. with five full bathrooms and two half-baths is listed for $1,995,000. Suzanne Gignilliat with Coldwell Banker said the brick-and-limestone house was built by Barnett Homes and is in a great location near the family-friendly Southport corridor. It has plenty of space and top-of-the-line details and finishes throughout, like the beamed/coffered ceilings, built-ins and millwork, she said. The main level has a combined living/dining room with a fireplace and space for a dining room table. The kitchen has an oversized island, custom antique-mirrored Sub-Zero fridge, custom soft-close cabinets, a butler’s pantry, eat-in area and state-of-the-art appliances. There is a mud room off the back entrance. The second floor has a spacious master suite with two walk-in-closets and an en suite bathroom with a soaking tub, shower and double vanity. Two additional bedrooms with en suite bathrooms and a laundry room are also on this level. The third floor has a bedroom, a study, a wet bar and multiple rooftop decks. The lower level has a wet bar, two bedrooms, a laundry room and a radiant-heat floor. The home also has a back patio and two-car garage. It is close to neighborhood restaurants, bars, grocery stores, cafes and schools. This article showcases a home of interest to our readers that's represented by an advertising partner.